Senator Elizabeth Warren introduced Bernie Sanders in Boston. It was as if the 2016 campaign never stopped. The cheering crowds were there. There were soaring speeches too, as Senator Bernie Sanders of Vermont railed against the billionaire class, and demanded health care for all and free college tuition. Even the presidential primary’s typical weather, a cascade of wet snow, fell outside, unseasonably late. 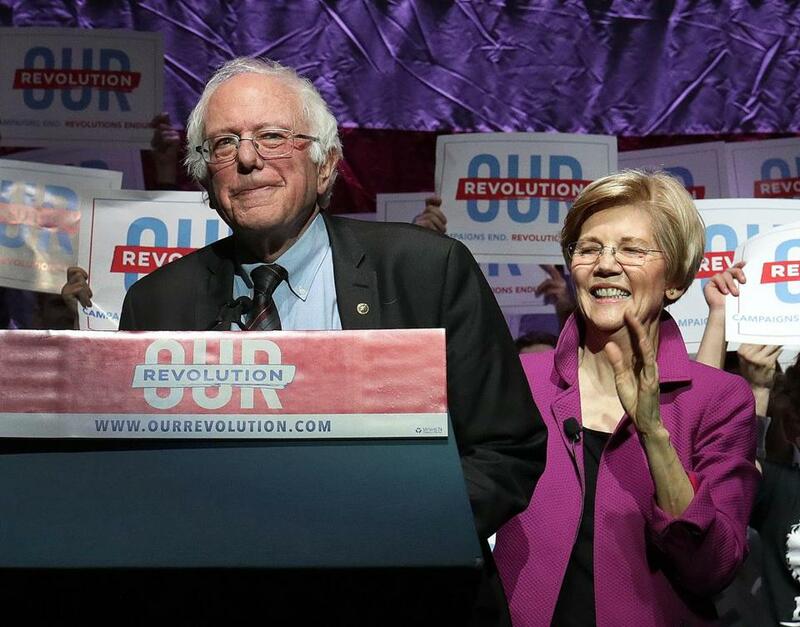 But this time, by Sanders’ side was Senator Elizabeth Warren — appearing together as two progressive rock stars rallying their faithful Friday evening. 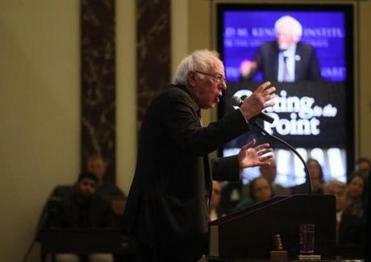 Sanders swept through the city Friday, speaking at the Edward M. Kennedy Institute for the US Senate in Dorchester, promoting his book at MIT in Cambridge, and appearing with Warren at a rally in the Orpheum Theatre. At each sold-out event, Sanders repeated much of the rhetoric that propelled him into the Democratic primary’s spotlight last year. Friday’s version included kind words for Warren. It was as if the 2016 campaign never stopped Friday. The loyal crowds were there. The anti-establishment rhetoric too. Less than a year ago, Warren declined to endorse Sanders’ candidacy, backing his opponent, Hillary Clinton, in the end. Sanders talked about the election he — and Democrats — lost last year, as well as the contest that Warren will face in 2018. The Vermont senator, a self-described democratic socialist who caucuses with the Democrats in the Senate, sharply criticized the Democratic Party. “Trump did not win the presidency. The Democratic Party lost the presidency,” Sanders said during an afternoon discussion moderated by the Globe’s James Pindell at the EMK Institute. “And when we do that, when we transform the Democratic Party, we transform America,” he told a 1,600-person audience at a rally in the Orpheum Theatre. Earlier on Friday, Sanders spoke for 45 minutes before answering questions for an overflow crowd inside the EMK Institute’s replica of the Senate chamber. When asked whether he planned to seek the presidency again in 2020, Sanders declined to say. “If you sit home and think Donald Trump won because all of the people who voted for him are racists or sexists or homophobes, I think you got it wrong. What he did is he developed campaign rhetoric and proposals . . . that addressed some of those issues,” he said. Long lines formed to see Senator Bernie Sanders at the Edward M. Kennedy Institute for the US Senate. More than 600 people braved the cold, slushy weather to hear Sanders at the EMK Institute. Another 200 watched in overflow rooms. 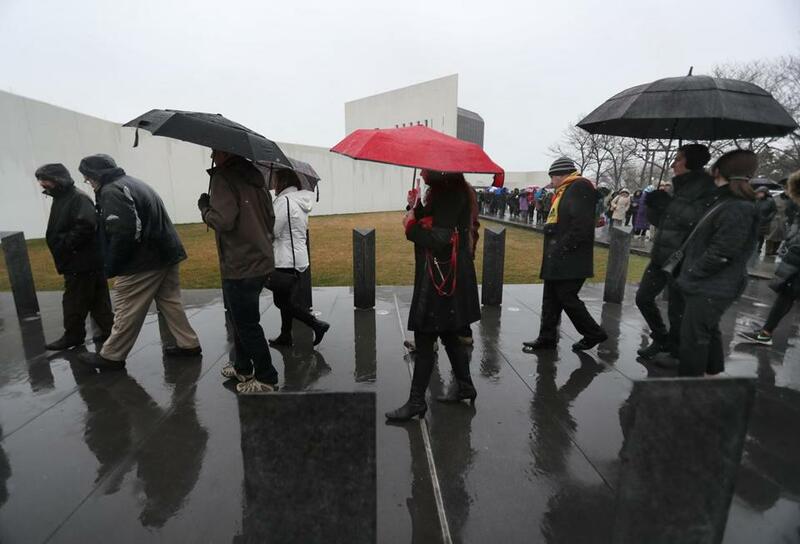 Officials at the EMK Institute said there was a wait list of about 1,000 people. Brenda Fluker said she was excited to finally see the senator from Vermont in person, having missed him during the campaign. Later on Friday, Sanders spoke to a sold-out crowd at MIT, highlighting many of the topics in his book, “Our Revolution.” Many of the same issues in his book, he said, were brought to the forefront during his presidential campaign. “I know people were mad at me that I wasn’t beating up Secretary Clinton, but that’s not who I am, and that’s not what I do,” he said. Then, it was on to the Orpheum Theatre. Tracy Bygate, 59, attended the rally with her husband, Hal Raymond, hoping to send a message to Republicans in Washington. Max Feldpausch, a 38-year-old Braintree man, said Friday’s rally was a chance for Democrats to take action, rather than just point fingers at Trump. He hopes to see the Democratic Party rebuild and “go in the right direction,” led by progressive leaders like Sanders and Warren. “I think everything has to start with the grass roots,’’ he said.